The Alpkit Gourdon 20 has a somewhat confusing identity/purpose in that it is more akin to a school bag than a mountaineering pack in many respects. However, various features and a lack of others make it far more useful for the latter rather than the former. A simplistic design helps to keep the weight and extraneous additions to a minimum. This helps to keep the cost down and allows the user to get the most from it in the real world where extraneous features are so often a hindrance rather than a help. The singular main compartment makes sense on a rucksack this size where you are never too far from being able to access the bottom of your rucksack. The twin mesh side pockets also afford additional accessible useful space. The roll top closure works well to keep the weather out, whilst allowing good access to the bag when required. This roll top closure, in conjunction with the taped waterproof seams and Taslan TPU Nylon fabric give far greater weather resistance than most other mountaineering packs (Of course gear should still be in dry bags in the main bag to prevent mixing wet and dry gear, but this weather resistance is a significant advantage when out in challenging weather). This also applies to the back panel, which although it’ll almost definitely give you a sweaty back it does shed rain and snow particularly well. The Alpkit Gourdon 20 credentials as a mountaineering rucksack continue further with the elastic cord compression system which is ideal when climbing to help cinch the pack down to a minimum size. The almost non-existent waist belt also helps to make for minimal fuss whilst climbing (In comparison with bulky inflexible waist belts). In many respects the Alpkit Gourdon 20 seems like an ideal minimalist mountaineering rucksack, however it does have its limitations. 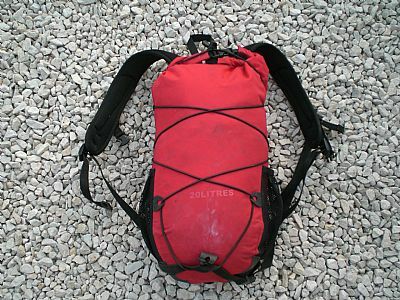 The lack of any major back support, fairly rudimentary shoulder straps and lack of a serious weight bearing hip-belt preclude it from carrying any significant weight for an extended period (You will definitely notice a full rack and crampons on your shoulders on a long walk in - its 20 litre capacity does obviously limit the amount of gear you would be able to carry anyway). With no ice axe attachment points you will also have to either adopt your technique (a singular axe between the back of the pack and your shoulder blades works well) or create an alternate attachment method. The Alpkit Gourdon 20 ticks many of the mountaineering rucksack requirements, and with a light load it fulfils the needs of a weather resistant compact relatively fuss free pack.